We kick off our new series Plant of the Month with Correa glabra var. leucoclada (rock correa), which is a plant characteristic of Morialta Conservation Park, DEWNR’s Park of the Month for Nov. 2015. Rock correa is found in the southern Mt. Lofty Ranges and eastern and central New South Wales. In South Australia it is confined to sheltered rocky habitats and steep gorges, mainly at Morialta, Torrens Gorge and Sturt Gorge. (Because of its restricted distribution it is listed as “rare” in S.A.) Morialta C.P. probably conserves the largest of these populations and you are bound to encounter it there, especially if you are on the walking trails near the waterfalls. 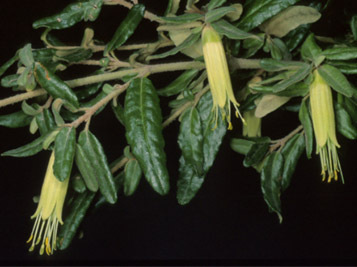 With its yellowish-green tubular flowers the variety is adapted for pollination by honeyeaters: their long bills they are able to reach the nectar at the base of the flower. Correa glabra var. leucoclada is related to the more common and widely distributed C. glabra var. 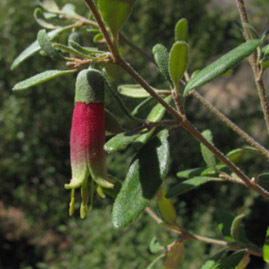 turnbullii (narrow-bell correa), which is found on rocky hills and plains in dryer habitat. Rock correa is distinguished from var. turnbullii by its yellow-green rather than red flowers, and the underside of the leaves and stems with more obvious scurfy hairs (giving a pale almost whitish appearance) rather than appearing smooth. This entry was posted in The Plant Press on 27 November, 2015 by Jürgen.